If you read anything here, you already know I’m a little freaked out because this is the first September in the history of my entire life that I am not going back to school. I’ve also had enough requests to run this class again that it seemed the apt thing to do. So yes, if you’ve been reading for a full year, you’ve seen this before. Don’t start thinking everything is going to be repeats — there’s plenty of new waiting for its moment to shine too! 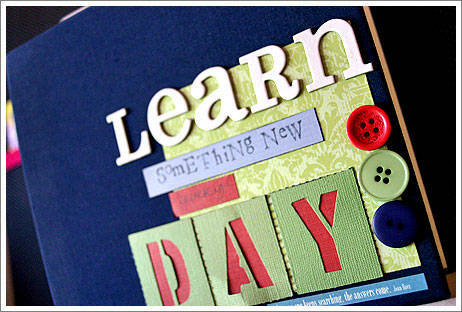 Learn Something New Every Day is a class to start the autumn term. Over the month of September, we’ll make thirty entries in this small-format book designed to getting your eyes open to observing your world. Worried about time? Fair enough. It does take time to make an entry every day. But the pages are small (6 inches square) and we’ll use some short cuts to keep your supplies to a nice small collection and we’ll focus on summary journalling rather than documenting each day with a full report. And every day you have the option of just duplicating the example page, so that could even eliminate your thinking time. We’re talking minutes every day here. Yes, this is a repeat class from 2006. Everyone who signed up in 2006 gets to play again, if you fancy. For free. If you’re joining in for the first time in 2007, you’ll get to see their work as we go. With each prompt, I’ll send you a list of links to their work posted on the internet so you can stay inspired and see that you really can make a page every day for a month. Class begins September 1. Don’t be late! Any questions? Just stick ‘em in the comments & I’ll get an answer to you asap. Here’s to a great September, whether you’re in school or out! Ooh – I chickened out of doing this last year as I was about to start my first teaching job – one year on and I’d like to play! I’ve been reading your blog for ages and I love it. I really want to do this class but I can’t get Paypal to work… I know this is cheeky but is there any other way I can pay? ooo great I never finished this last time – hopefully I will now. How do we sign up again? Fantastic – I’ve just started to coplete the first time around pages and am no where near finished! How do we sign up again? I did this last year, and it was a really great class. Just might do it again! I did this last year…I would like to do it again. You mentioned it would be free this time-how do I sign up without paying the $15.00 again? Thank you! Looking forward to this! Woohoo! I must say that for one I am excited since I did not do this last year…. for obvious reasons and it will be nice to go back to school in a sense… because yes, this whole not school thing is freaking me out as well. Yay- my first Shimelle class. Thank you! I haven’t forgotten about you I just need to find the files and get the children back in school. I will email soon. Yeah!!! I have been a stalker for a while and finally, here’s a class (highly recommended by my WT peers:) that my schedule allows me to take!!! I am SOOOO excited!! My first ever online class!!! Love your posts. You inspire me so much. I’ve never done a class of any kind but always wanted to! oooh. I really like the sounds of this. Only prob is I’m going away for three days in the middle of the month. Will that be a prob or will it be something you can catch up on if need be? PLEASE SIGN ME UP AS I’M A SCRAPBOOK CLASS VIRGIN!! woohoo! can’t wait for this one, shim! My oldest son just started 6th grade at a new school. So boy can I relate to the “Will I know someone?” question. Now that he’s all settled in I look forward to the opportunity to learn something new. What a great opportunity!! I signed up and paid through paypal and I have a question. I wanted to gather supplies together this weekend, before class starts. Is there a supply list for the class? I am trying to figure out if my payment went through or not. I entered my CC number and infor but then it just acted a little wonky – I don’t want to miss out on the class but don’t want to pay twice. I would really appreciate an email either way – thanks so much – I didn’t go through my paypal account because I wanted to put it on my CC so I have no way of checking if it actually posted. I am SO ready to get started – but I don’t know how... I joined the yahoo group and am in the process of reading through the posts – but I need the instructions ya know? and can’t wait for the ckc convention in washington – signed up for each of your classes – going to be SO fun! I know I’m a bit behind but would love to do this again but how to we get signed up if we did it last year? I, too, am late and did it last year…how do I get signed up again? a little late start, but just purchased the class through paypal, without reading fully. Thank you for another class and your special talents. I know September is nearly over, but is the class still available to buy and possibly be adapted to use next month? Just wondered because I’m starting a new job on the 1st oct so would be great to document daily! $15??? it’s too expensive for such item!